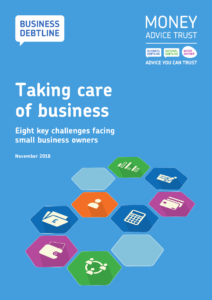 Joanna Elson OBE, chief executive of the Money Advice Trust, provides an overview of the findings of Taking Ca re of Business, our new report published today on eight key challenges facing small business owners. Self-employment and small business ownership continues to grow and plays a crucial role in driving forward our economy. While many of these businesses are able to flourish, a growing number are struggling with high levels of debt, putting both their business and personal finances at risk. Last year Business Debtline helped more than 36,000 people to tackle their business and personal debts on the phone and via webchat, with another 167,000 supported digitally – and today we have published a new report on eight key challenges that they and other small business owners face, together with recommendations on how they can be addressed. Issues such as low and variable incomes, late payments and sometimes a lack of business management skills are at the heart of many of the problems that our Business Debtline advisers help small business owners to resolve. Low and variable incomes: low and variable incomes go hand in hand with self-employment for many, with people in self-employed people earning less on average than those in employment. The incomes of Business Debtline clients varies, but 39% of our clients have gross turnovers of less than £25,000 a year – with the unpredictability of this income also a key issue. Use of banking products: many small business owners to use a single bank account for managing both their business and household finances. This is just one part of a broader intermingling of personal and business finances which can present challenges – 61% of Business Debtline callers surveyed have used personal credit to cover business costs in the last two years. Business management skills gap: people can be passionate about a business idea, or skilled at a particular trade, but still lack the business management skills and knowledge they need to make their business successful. Before they started trading, most Business Debtline callers felt confident completing a budget (80%) but were less confident constructing a business plan (59%) and completing tax and VAT returns (47%). Vulnerable circumstances: small business owners in financial difficulty are often also impacted by a range of vulnerable circumstances that can exacerbate their financial situation, such as mental health problems, serious illness or bereauthoravement. Around seven in 10 Business Debtline callers surveyed (69%) self-identified as being in a vulnerable situation. Problems with tax and benefits: Completing tax and VAT returns can be a complicated and time consuming process. The benefit system can also be difficult to navigate, particularly for self-employed people – around a quarter of Business Debtline clients were in receipt of tax credits or benefits at the time they called us. Lack of financial resilience: low incomes and in some cases a lack of understanding of how saving and pension products work can make it difficult for small business owners to save for the future. 58% of Business Debtline clients surveyed said they had not been contributing to a pension or savings. Experiences with creditors: Whilst most people had positive experiences with the organisations they owed money to, a significant minority – approximately one in three of Business Debtline clients surveyed – said they felt they had not been treated fairly by at least one of their creditors. When it comes to supporting small business owners in financial difficulty, there has been positive news this year – with the government confirming its intention that the new Single Financial Guidance Body should have self-employed people firmly within its remit, and – as I blogged last week – the Treasury announcing plans to include sole traders with business debts in its new Breathing Space scheme.  There is also an increasing recognition of Business Debtline and the support it provides, and we are continuing to grow this aspect of the Money Advice Trust’s work. By the end of this year we will have 45 dedicated advisers at Business Debtline, helping even more small business owners who need our support. However, still more needs to be done. In the report we set out recommendations for government, creditors and the advice sector to consider to achieve this aim. You can read our recommendations in full here. A final note – this report has been authored by Evridiki Kaliakatsou, who has joined us from the Payment Services Regulator through the Financial Conduct Authority’s secondment scheme. We are grateful to her and to both organisations for their support in producing the report – and also to Experian for their support in producing an analysis of Business Debtline clients. We are looking forward to presenting our findings at various conferences and events in the next few months – starting with the Talk Money conference next week – and will be making the case for our various recommendations over the coming months. Read our new report, Taking care of business, in full here.